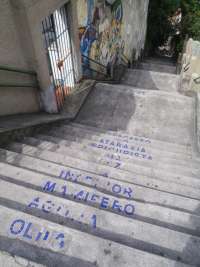 Popular artist Getulio Damado has found himself on the front lines in the current battle over public space in Rio de Janeiro. Recently an order came from the city, part of the 'Choque de Ordem' (Blitz of Order) clean-up in preparation for the World Cup of Soccer and the Olympic Games. 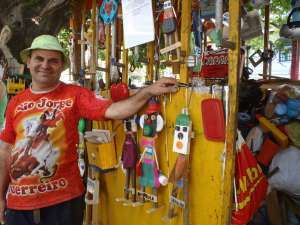 Getulio was to vacate the space he has occupied on the sidewalk for 25 years since he first created his replica of the Santa Teresa tram. 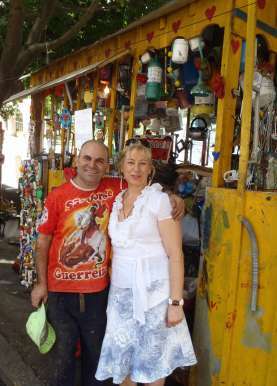 From here on the street, where Almirante Alexandrino meets with Leo Poldo Froes, 15, he has been creating art from 'junk' and cast-offs that show his 'love for children and his desire to make things for them'. His little cart has become a destination point for visitors to Santa and his work has been shown as far away as Germany and Holland. The entire community has risen to defend Getulio Damado's right to be on this piece of sidewalk, a lawyer has offered to represent him and a petition grows in length. It appears that this outpouring of support is being heard. Getulio shows me an official letter from Rio Prefeitur (Rio City Hall) that he received only two days ago. Deputy Mayor Thiago Barcellos states that 'considering that artistic activity is of great cultural value...he has no objection to his permanent stay at this place.' Could this be the first victory in the fight against the sterilization of public space in Rio de Janeiro? 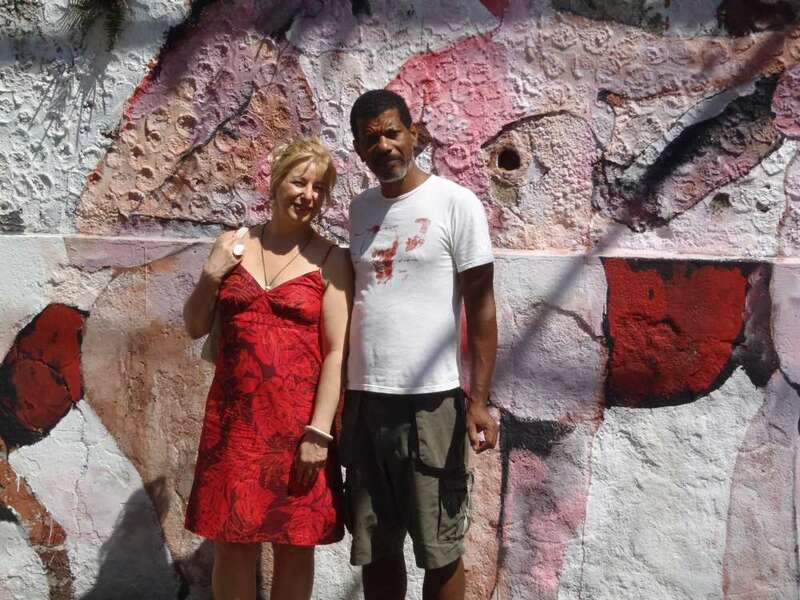 We continue on our way to visit Marcilio Barroco, the mask-maker with a deep understanding of the history of community art and collective art-making in Santa Teresa. Passing through a park we encounter the young actor Fabio Negret studying the history of civilizations from a book. Self-educated, he is an example of dedication and commitment to become an actor. Fabio belongs to 'Cia dos Comuns' (Company of the Commons), a theatre group that develops works through a collaborative process. A recent production was about the first Candace in the dynasty of female warrior queens in ancient Ethiopia. Candace ruled without a man, and parallels were drawn in the play with the situation of women in the favela who, for many reasons, find themselves alone and having to take care of things without support of men. Fabio emphasized the importance of established artists in passing on knowledge to the youth - young artists struggling to make their way. This led us to reflect on how the movement away from the traditional apprenticeship model of the transfer of knowledge in the arts and towards a formal 'professional' institutional system of learning has closed one avenue of access for some young artists. Upon meeting Marcilio Barroco, he brought our attention to the Casa da Flor. Created over many years by Gabriel Jouquim dos Santos (1892-1985), the son of slaves, it has become an icon in Brazil that resonates with these two prominent themes: the creation of art from cast-off and found materials, and the determination of the self-made artist. On Sunday evening there was a memorial produced by the artists of Santa Teresa to honour the life of Mestre Messias who died this year one week before carnival. This man was born in Minas Gerais but lived for many years in Santa Teresa. A poet, musician, composer and painter he was known to all and was an inspiration to other local artists. He was knowledgable in African music and composed Jongo music as well as Samba. And so, after the futbol match between Flamengo and Vasco came to it's conclusion with Flamengo scoring the winning goal in a penalty shot, the shouts could be heard throughout the city and people began to make their way up to the Parque das Ruinas. Many musicians and Jongo dancers contributed to an evening of incredible song, percussion and dance that continued late into the night. Films of Maestre Messias were projected onto a wall to the side of the stage. A refreshing breeze blew across the top of the hill while the community joined the dance on stage. 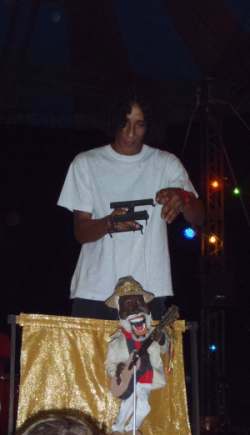 The children gathered in awe as puppet master Marco Nogueira performed with a puppet he had created of Maestre Messias singing one of his songs. La se foi o poeta Messias.